Crazy, edgy, offbeat and fun. Just some of the adjectives used to describe the pilot episode of Doom Patrol, the latest series of original programming from DC Universe. Delivering a debut episode as strong as any in recent memory, Doom Patrol is a hit! The show feels very different from anything else out there at this time, giving it a niche all of its own. Whilst the Doom Patrol were previously introduced in episode 4 of Titans, that backdoor pilot is not essential viewing as a precursor to this. Whilst the setting and majority of principal characters remain the same, essentially here we are starting from scratch. And what a start! Alan Tudyk’s mysterious Eric Morden serves as the narrator throughout the episode, introducing us to the Doom Patrol members. Each key member is given a full origin story, including a full backstory too. Robotman, Negative Man and Elasti-Woman are shown in their original guises of Cliff Steele, Larry Trainor and Rita Farr. Each of their traumatic and gruesome transformations are given full portrayals, often in graphic detail. Morden’s narrative helps the casual viewer to understand exactly what has transpired, and Tudyk’s delivery is done with no little helping of dark humour. Dark humour is a frequent motif throughout the episode, as even the most painful or horrific situation is given levity by a sharp one-liner. Morden’s own back story is given a brief examination too, as a visit to post-war Paraguay shows his own transformation and sets up his role as a nemesis to the Doom Patrol. What I loved about him and his voiceover is it often broke the fourth wall and addressed the audience direct, mocking both the genre and its conventions. This meta quality is a fresh slant for a comic book television show and serves to show that this is something very new. The performances are all top drawer, as each Doom Patrol member is given plenty to do in both the comedic and dramatic side of things. Timothy Dalton, here taking over as Niles “Chief” Caulder from Bruno Bichir’s previous interpretation, deserves special praise. Still in my eyes the best James Bond to date, Dalton gives a hugely charismatic performance, dripping in gravitas. He effectively portrays the character with warmth, showing a genuine affection for the team members he has saved from the abyss, but as always with Dalton, there is a sense of danger beneath the surface. Where they can take the character as the season progresses is very exciting. Brendan Fraser is hugely enjoyable as Cliff Steele/Robotman. The mainstay of the Doom Patrol in the comics, the character is given a very faithful live action potrayal here. 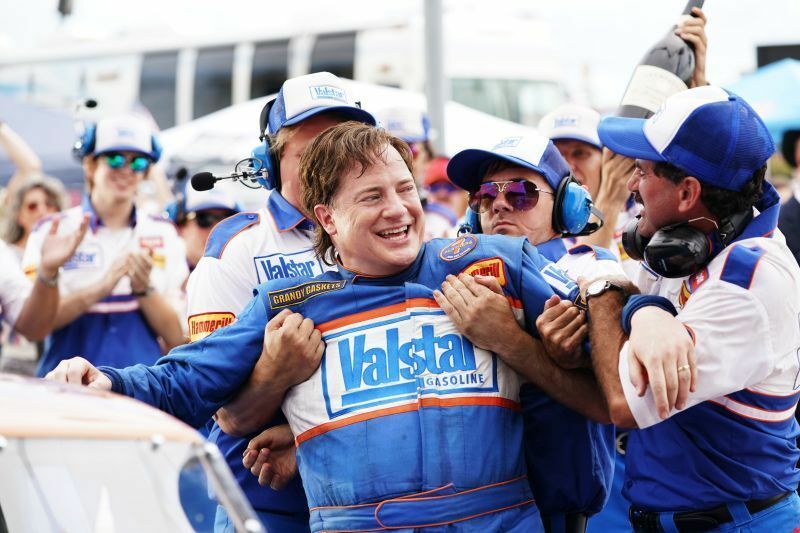 Steele is depicted as an overweight, mulleted, unfaithful husband/NASCAR superstar in the 1980’s, drinking his way through life. Played mostly for laughs at this point, Fraser’s comedic skills are brought to the fore, as he fills the screen with loud charisma. In his post accident guise as Robotman, an expressionless automaton, just the voicework of Fraser gives the character huge depth, as he suffers through is tremendous loss and tragic situation, trapped in a robot body, memories fully intact and unable to be the man he once was, due to the passing of time and his new status. 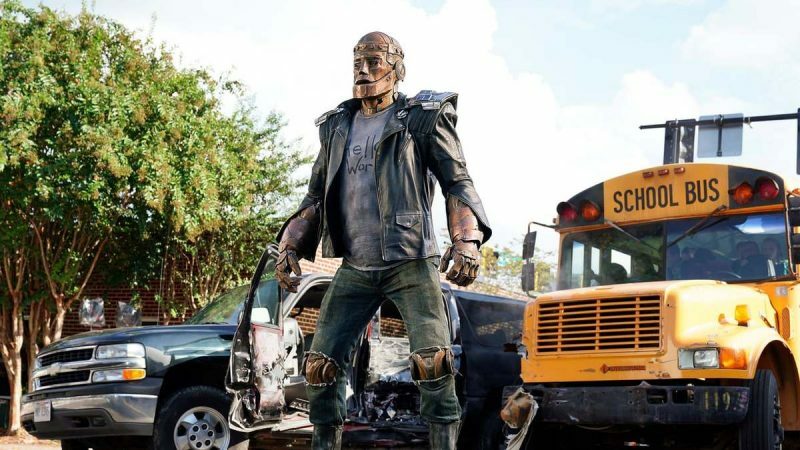 The Robotman visage is lifted straight out of the comic book pages, and through what appears to be mostly practical effects rather than CGI, a wonderful DC character is given its due on the television screen. Every member of the cast is at the top of their game. April Bowlby gives a complex performance as Rita Farr, a move star from the 1950s that is barely holding herself together, both literally and figuratively. There is so much gold to mine with this character as the season proceeds. Similarly Diane Guerrero excels as Crazy Jane, a character with 64 separate personalities, each one with its own superpower. Only a couple are on display in this pilot episode, but the potential to see them all over multiple seasons of the show is mouthwatering stuff. The brief glimpse of her Sun Daddy personality during the episode’s action set piece is worth the price of admission alone, or should I say the price of a DC Universe subscription! I do not wish to fill this review with plot spoilers or a verbatim recap, so my advice is to watch it by any means necessary. If dark comedy, adult content (do not let your kids watch this), great characters and craziness are your bag, then this is the show for you. 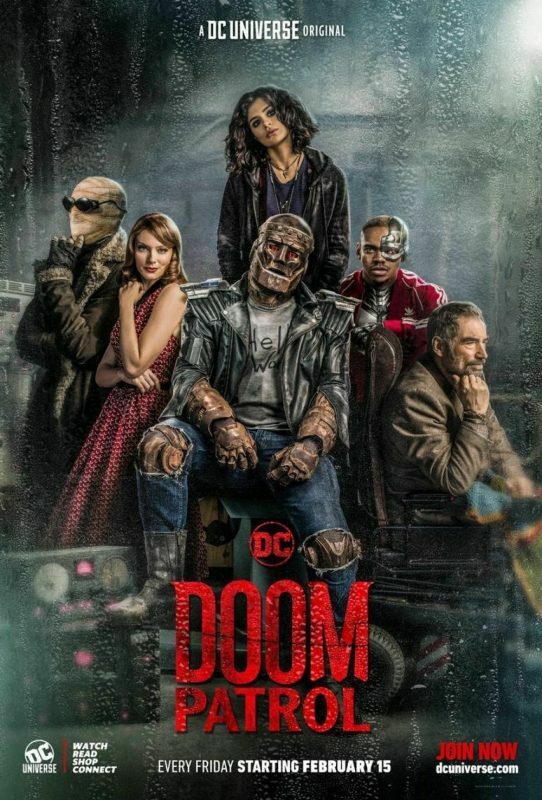 With a cliffhanger ending that means episode two cannot come soon enough, plus the promise that Victor Stone/Cyborg will make his series debut and join the team, Doom Patrol is shaping up to be the television show of 2019, and a perfect example of the wonderfully diverse content that DC are putting out into the world, both on the cinema and television screens. Seek it out! !